Fyodor Lukyanov: To use the wind metaphor – let the east wind blow some more. Let us hear from our colleague from Japan. What do you think he will ask, Mr President? Vladimir Putin: I have no idea. Fyodor Lukyanov: Neither do I.
Vladimir Putin: Is it about the islands again? Not interested. Question: Sorry, but I have to ask. Two years ago, I asked you here in this hall how realistic it was to expect a favourable atmosphere for Japan and Russia to sign a peace treaty in the near future, say within two, three or four years. You said it was wrong, impossible and even harmful to set a fixed timeframe, because there was not enough trust between us at the time. Could you please clarify: does this mean that enough trust has already been established between us to sign a peace treaty, bearing in mind what you said two years ago, or does it mean something else? Vladimir Putin: Indeed, I spoke about the need to build trust. I am not saying what comes next is an insurmountable obstacle. Nonetheless, we are talking about increasing trust, about the possibility of signing a peace treaty, of reaching some compromise on the territorial issues that Japan constantly raises, although we do not believe they even exist, and yet, we do not reject this dialogue. At the request of Prime Minister Abe, we have established simplified formalities for Japanese citizens visiting these territories, so they can visit their historical places, family graves, and so on. That is, for our part, we are tying to create the necessary conditions of trust. However, Japan has imposed sanctions against us. Do you think this looks like a step towards increasing trust? What does Syria or Crimea have to do with Japan? Why did you do it? To increase trust? Yet, we still do not refuse; we are ready to continue this dialogue. We are not avoiding contacts. Just now, your Chinese colleague asked a question. We have been having a discussion over territorial issues with China for many years, for 40 years, in fact. Can you imagine that? Forty years. Russia-China relations saw a lot in that time, but in the end, we signed a friendship agreement. And we have reached a level of understanding between Russia and China that is assessed as unprecedented by both our countries. However, the territorial issue had not been resolved yet by that time. But the fact that we signed these documents with China, with our Chinese friends, the fact that we have built such a system of relations – did it put an end to our debates over the territorial issues? No, it did not. On the contrary, this created an environment necessary for resolving these issues, which is exactly what we did in the end – we signed the necessary document, finding compromise. I said the same thing to Prime Minister Shinzo Abe. I said that if we fail to sign this peace agreement now, without resolving the issue of those islands, this would not mean that we would consign it to the dustbin of history and go on as if nothing happened. The example of our relations with China showcases the opposite: we created an environment of trust, and then resolved the issue. This was exactly what I suggested. Our dispute with Japan over these issues dates back 70 years, and we cannot seem to find a solution, a way out of the dead end. But let us finally sign this peace agreement, work on improving our level of trust, refrain from creating new problems in bilateral relations and move on, and keep discussing these territorial issues. We are not saying no, but Prime Minister Abe has his own opinion on this. Later, when we attended the junior judo tournament, we continued discussing this issue in an informal setting. He said that as of today, Japan finds this approach unacceptable, and we must first find solutions to the issues that are key to resolving the territorial issues, and then start discussing a peace agreement. We can do that, but we have been doing it for 70 years, and there seems to be no end in sight. We are talking about carrying out joint economic activities on these islands, and the ideas are good, but so far, they are being implemented on a very small scale – that is the problem. However, we are ready to keep working on this, certainly. Fyodor Lukyanov: Your Grace Metropolitan Tikhon, please. Chairman of the Patriarchal Council for Culture Metropolitan Tikhon: The round table I took part in here, at Valdai, dealt with cultural issues, or to be exact, whether and how culture can affect the life of society in the 21st century and today. At the onset of the discussion Mr Zanussi asked the following question, Can we even grasp, can we assess a nation’s culture today? An opinion was voiced that the level of charity in society may be such an assessment criterion. I mean general culture, not its specific manifestations. It may seem that it was a fairly abstract discussion. But the events in Kerch, even though we do not fully understand the motives behind this ill-fated person’s actions, let us see how aggression and intolerance are on the rise not only in Russia but also generally everywhere. My question is as follows: Firstly, what do you yourself think of the conclusions we have made at this round table regarding charity as a key criterion of society’s general culture? Secondly, we talk a lot of about state culture policy nowadays. There is a lot of debate. We are all aware that the state will not regulate culture in a rough or intrusive way, and this is probably absolutely correct. But can the state deliberately support all those creative and historical spiritual and cultural keynote dominants that have developed in Russia, something we call spiritual and cultural values? 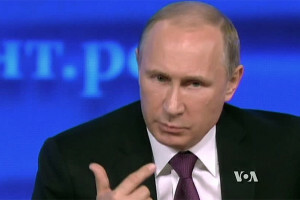 Vladimir Putin: I think this what we have been doing, in reference to the second part of your question. I think the state must do this very carefully by allowing people with different outlooks to work out their own views, express them and compete, let us say, with your views. It may seem surprising for me to say that, but I think this is the way it is. My sympathies certainly lie with you, but as a state official, I still think it is my duty to ensure the opportunity for every person to express their position. Why? Because my position is based on the first part of your comment. What is charity? To use more modern words, it is tolerance, commitment to compromise. At any rate, it is one of the facets of charity. This is the way it is. If we claim that charity, tolerance is a criterion of culture, then we must be in a position to let people express their views and listen to them. Fyodor Lukyanov: Since His Grace raised the issue of charity, I cannot but give the floor to Nyuta Federmesser. Founder of the Vera Hospice Charity Fund Nyuta Federmesser: Thank you very much. First, thank you for the chance to be here. Yesterday there was also a very important discussion on the interaction between society and the authorities. Thank you for bringing me in on this issue. Vladimir Putin: This may happen in a variety of ways. In palliative care, in hospices, dying is always preceded by a tremendous concentration of love. Because when people know that this is to come, that it is ahead and that they do not have much time, they spend all that time saying, “Forgive me,” “I forgive you” and “I love you.” Whereas what we talked about here was about a different kind of death: death related to hate. You said you have no fear, no fear of the responsibility for the world. We have an incredible number of people in our country totalling 18 million with family members, 18 million of those who have fear because their loved ones are severely ill or dying without getting adequate help. I would very much like that alongside considering Russia’s totally different role in world history and sanctions from all sides, we would also discuss the people who make up the country. Eighteen million is a huge figure. There are 1,300,000 – one million three hundred thousand ­- of those who die each year while needing that care. I want to see care for those people, who are afraid, also to become a priority area. I want them to reply as easily as you did to that question, “I have no fear.” No fear because they know that the state will protect them, the system will protect them, and this help is very inexpensive. And to protect them, there is no need to reshuffle the economy and re-shape the GDP or whatever. What is needed is your very firm decision, as firm as regarding the issues discussed earlier. Well, that is probably all. I just want those people to also be able to quietly say “We have no fear” thanks to your efforts. Thank you very much. I have the relevant papers with me. Vladimir Putin: All right, I will definitely take them. Firstly, I completely agree with you that our discussions, our internal discussions should be centred on our problems, domestic problems, our people’s lives, which is actually a major part of our work. And as you said, the fact that we are discussing war – and not just war but terrorism and other similar issues – is due to the way our host Mr Lukyaunov organised the discussion, I am not the one who organises it, it is done by the host, so let us put all the blame on him. As to the problem you raised, it is obviously very sensitive, demanding special attention and tact from the state. Ultimately – you said it yourself – the state allocated the funds. The fact that only 12 or 16 percent were used means the work was poorly organised. I assure you that it does not mean that I will say to you, “The money was allocated and you did not use it, so that’s it, good-bye.” Do not worry, this will never happen. I know the way money is spent, and very often, funds allocated by the state to handle certain matters of absolute priority do not reach the end receiver. If they are returned to the budget, it does not mean that they will stay there for good and the necessary funds will never be allocated again. We will certainly keep doing it. Yet we have to admit that whatever the state might do, it is impossible to completely solve any problem 100 percent. Life is more complicated and keeps throwing in more and more of new problems for us. Of course, efforts by the state are very important, as are those by society and religious organisations, by the way. It is religious organisations, and I mean our traditional faiths, that create the internal strength and internal basis for any person to feel secure in this fast-changing and fairly dangerous world. The state will definitely pursue all the tasks in the context you have just mentioned. Do not worry. I will take your documents, of course. It does not mean we will wrap up the topic just because someone underused the funds. Have no doubt. I will see why such a small percentage was spent. It looks strange. Fyodor Lukyanov: I seem to be the chief militarist here. I am going to prove this is not true. Behind me is the world’s most cheerful man, a food producer, who made an indelible impression during the conference. Head of the Cheesemakers Union of Russia Oleg Sirota: Good afternoon, Mr President. I am a farmer from Moscow Region, I make cheese. Let me begin by saying on behalf of the farmers, we have been telling you this repeatedly over the last four years…. Fyodor Lukyanov: Mr Sirota, the concise version, please. Vladimir Putin: You should thank the Americans, not me. Oleg Sirota: That is what we were debating, who to thank, Obama, Merkel or you? Anyway, thank you for all of that. Russian agriculture is clearly thriving. Take me: I sold my flat, my car, my business, made an investment, and my cheese-making factory has been growing 300 percent a year. The agricultural breakthrough is boosted by protectionism, the sanction shield, the cheap ruble, and care, such as record subsidies. Vladimir Putin: What kind of cheese do you produce? Oleg Sirota: Hard and semi-hard. We are thinking about exporting them. Next year, our cheese will make Vienna, Munich and Berlin tremble. I assure you, we already have an agreement. Vladimir Putin: Will they tremble because your product is delicious, or because it is something else? Oleg Sirota: Because it is delicious. Vladimir Putin: Or is it the smell? Oleg Sirota: Our cheese is tasty, hard and cheap thanks to the ruble rates. It is attracting investors, including international ones. Everyone has begun investing in Russia’s agriculture. We have partners from Switzerland who relocated to Russia and are building farms. I was asked repeatedly during the session about what would happen if the sanctions were cancelled. What would I do? Would it be a disaster? So I have a question myself: will the Government continue to pay close attention to our industry, to support it and to continue with protectionism, if the sanctions are lifted? Because we need to be able to sleep well for a few years. And a personal question, if I may. Mr President, I am Russia’s record holder in that I have tried nine times to give you my cheese as a gift, and nine times it was confiscated by your security detail, who must be doing a great job. Vladimir Putin: And enjoying great meals as well. Oleg Sirota: It would seem so. So my question is whether they have let the cheese through, Mr President, or not? One time I even wrote a message thanking you for the sanctions. They said they were going to pass it on. Did they? Or did they eat it themselves? Vladimir Putin: They ate it. Vladimir Putin: They ate it themselves. This is not a joke, what I am going to tell you. My colleagues gave me several bottles of wine, and my security asked whether they should test it or if I would drink it. I told them to check it. Especially given that I am not big on alcohol. Regarding cheese and what happens if sanctions are lifted. First of all, we are not seeing them readying to lift any sanctions so you can sleep tight. Second. The longer it goes on, the less likely those who quit Russia’s market are to be able to return. You know this better than I do, as a producer. If your product is of high quality, as it seems to be the case, and if you are thinking about exporting, it means that your quality is on par with competition, but production and logistics costs will always be lower. Therefore, your rivals will have a hard time pushing you out of the domestic market. I think it is virtually impossible, especially if you work with retail chains and shops. Still, you need to be ready that they may try. You know, I want to say this. You and I, let me say “we”. Why? Because we are onto one and the same task – developing Russia’s economy, and, in this case, such an important industry as agriculture. We need to be ready to face competition. There is no use thinking that we will continue to restrict and block foreigners, keeping our market exclusive for domestic producers. If we do, the quality will fall in the end. I am not talking about cheese alone, but about all agricultural production, and not just agricultural. We need to create natural market competition, at this time at the very least between domestic producers. We will be focusing on this. Support to agriculture will not dwindle, we will be stepping it up. Oleg Sirota: Excellent. Thank you. Fyodor Lukyanov: Stop, Oleg, you are not the only one here. Oleg Sirota: I have got a head of cheese for you. Please, come and get it, it has been waiting for you for four years. Fyodor Lukyanov: Here it comes. Vladimir Putin: Let me have it right now, or it will not get through again. Vladimir Putin: I hope to finally get your cheese. Where are you based? Oleg Sirota: Istra, Moscow Region. Vladimir Putin: Is the cheese there? Oleg Sirota: On the shelf in storage. Oleg Sirota: It has been waiting for you for four years. Fyodor Lukyanov: What is more, the quality has not deteriorated. Vladimir Putin: That is because it is good. What do you call it? Oleg Sirota: You must have tasted it while stationed in Germany. It is Bergkäse, a hard Alpine cheese. Oleg Sirota: We call it Istra Cheese. Fyodor Lukyanov: Mr President, do inform Karin Kneissl that they are going to tremble over there in Vienna. After all, the cheese is coming. Vladimir Putin: And the consumers will like it. Ragida Dergham, go ahead, please. Ragida Dergham: Thank you, my name is Ragida Dergham. I am Founder and Executive Chairman of Beirut Institute. It’s a think tank for the Arab region with a global reach. So I have specific question about three countries, Egypt, Saudi Arabia and Iran. On Saudi Arabia, of course, the world is preoccupied with the developments, and I’m wondering what consequences or… Do you see that there may be consequences, on your particular relationships, Russian-Saudi relations, given that you have been eager to have good relations and beyond. On Egypt, you had magnificent success yesterday with President el-Sisi. Did you agree also that Egypt would play a role in Syria, particularly, in rehabilitating the government of Syria with the Arab League and the Gulf states? And lastly, on Iran. Why, Mr President, don’t you feel comfortable asking the Iranians to withdraw from Syria since you have said in the past all forces would go. Why can’t you be specific? That would help probably in bringing your own troops back home. And maybe the public would be more comfortable then being worried about their troops. And also, this is a big issue between you and the United States. And I think I have heard you say you would like to have good relations. Can you solve that? Do you feel comfortable to deal with the Iranian question and have better relations with the United States? Thank you, sir. Vladimir Putin: I will begin with the last part of your question, Iran. It is better to worry about our military personnel on the territory of Syria instead of having to worry about our fighters on Russia’s territory. Fighting terrorists while they are still far away from our borders is better for us in order to prevent them from coming to our country. This has already happened in the not-so-distant past, as I have already mentioned. It is better for us to fight them over there, rather than here. This is the first thing I wanted to say. Second, coming back to Iran. It is not up to Russia to persuade Iran to leave Syria. After all, both Syria and Iran are sovereign countries, and they should build their own relationship. Yes, Russia does have serious, deep-rooted ties both with Iran and Syria. Moreover, we have been able to resolve certain issues by engaging in dialogue and discussions with our Iranian partners, including on withdrawing offensive systems from the Israeli border and the Golan Heights. As for the complete withdrawal, this is a separate issue that has to be resolved through dialogue between Iran and Syria, as well as between Iran and the United States. We are ready to join this discussion. Third, in order for Syria to move forward with the help of its allies, including Iran, the Syrian state needs a safe and enabling environment. This means that those who want Iranian troops to withdraw from Syria must guarantee non-interference in the domestic affairs of the Syrian Arab Republic, stop funding terrorists or using them for political aims to fight the legitimate regime in Syria, its government, and so on. This is a complicated matter that is relevant for all parties to this conflict. As I have already pointed out in public, Russia believes that once the decisions of this kind are taken, including the definitive victory over terrorists, all foreign troops must leave the Syrian Arab Republic as the country improves its defence capability and in keeping with the wishes of the Syrian government. This is the main criteria. Now concerning Saudi Arabia. What is it that is bothering you? I can’t understand. We have built really good relations with Saudi Arabia in recent years. Please, specify your question about Saudi Arabia. What is it that is perplexing you in this regard? Why should our relations with Saudi Arabia break down? Ragida Dergham: As you know, because of the developments in Istanbul, at the Saudi Consulate, there is a big interest worldwide in the investigation regarding the assassination or the killing of Jamal Khashoggi, the journalist who was our colleague and has been a participant in the Valdai Group. So this is what I am talking about. Right now, of course, there is pressure on President Trump that may reflect on the mid-term elections, and there are countries pulling out and countries being concerned, I mean, media and others are concerned about continuing to be present in Saudi Arabia given the alleged feeling that maybe someone in the government may be involved in this atrocity, of killing of Jamal Khashoggi. That is what I meant. Do you think it will impact your relations with Saudi Arabia at all? And please do not forget the questions about Egypt. Vladimir Putin: As far as I know, the journalist, who has disappeared and whom you have just mentioned, lived in the United States of America. He lived in the US, not in Russia. In this sense, the US, of course, bears certain responsibility for what has happened to him. This goes without saying. He was the one to go to the United States for asylum. In this connection, I would like to say the following. First, we should wait for the results of the investigation to become available. How can we, Russia, start spoiling relations with Saudi Arabia while being unaware of what has really happened over there? As far as I can judge, this man was to a certain extent a member of the Saudi elite. In some way or other, he was connected with certain ruling circles. It is hard to say, what is going on there. But we can see that complicated processes are also taking place within the US elites. I hope America will not go as far as Saudi Arabia did. But we don’t know what, in fact, has happened over there. So why should we take any steps directed at downgrading our relations, if we do not understand what is really happening? If someone understands it and believes that a murder has been committed, then I hope that some evidence will be presented and we will adopt relevant decisions based on this evidence. This gives me a pretext to say something else. From time to time, there are steps taken against Russia and even sanctions are imposed, as I have repeatedly said, on the basis of flimsy excuses and pretexts. They groundlessly claim that we have allegedly used chemical weapons, even though, incidentally, we have destroyed our chemical weapons, while the United States has failed to do so despite the obligation to that effect it assumed. So, there is no proof against Russia but steps are being taken. According to claims, the murder was committed in Istanbul, but no steps are being taken. Uniform approaches to problems of this kind should be sorted. To reiterate: Our policy towards Saudi Arabia has evolved over a long period of time, over many years. Of course, it is a misfortune that a man has disappeared, but we must understand what has really happened. Yes, as for Egypt, we have very good, friendly relations. We recently marked the 75th anniversary of our diplomatic relations and they are not being revived, they have been revived and the quality and level of our relations are actively improving. We have ambitious plans for joint work in the economy and energy, I mean both hydrocarbons and nuclear energy. We are starting to build a nuclear power plant, as you know, using a Russian-provided $25 billion loan. It is a good loan with an advantageous interest rate. The payments of the principal amount will begin in 2029, so these conditions are quite good. Thus, we both provide orders for our power-generating equipment manufacturers and develop Egypt’s economy. We cooperate very effectively in industrial production: we have agreed to obtain a large, 525-hectare plot of land, where we will build timber processing, engineering, pharmaceutical and other facilities, creating 35,000 jobs. As for the overall value of investments, we count on at least $7 billion. Our state allocation will be $190 million to create the necessary infrastructure. We also work a lot in the area of military-technical cooperation and purely military cooperation. We regularly hold joint military exercises, both in Russia and Egypt. The most recent one, I think, finished in Egypt just yesterday or maybe is still on. We have developed our relationship and will go further with this, and our partners are interested in doing so. As for Egypt’s participation in the Syrian settlement, it is significant. There is the so-called Cairo Platform that unites a number of opposition groups. We see that Cairo has a positive influence on these people and encourages them to work with the Government of Syria, but, naturally, they have their own position on how the work should be organised. As usual, the eventual result will arise from compromises and agreements. Fyodor Lukyanov: Mr President, a practical question to follow: Is flight security in Egypt no longer an issue? Has it been resolved? Vladimir Putin: No, it has not. As you know, we resumed flights between Moscow and Cairo. Charter flights to Sharm El Sheikh and Hurghada are to reopen soon. We discussed this issue with President el-Sisi, and I think that these routes will restart soon. However, our experts at the Ministry of Transport and special security services, along with their Egyptian colleagues, have a bit more work to do. We know what they have to do and by what time. I will not get ahead of myself, but I hope it will happen soon. Fyodor Lukyanov: Professor Toloraya, please. Georgy Toloraya: Georgy Toloraya, the Russky Mir Foundation and the National Committee for BRICS Studies. Mr President, in the morning we widely discussed Asia, the east wind and Russia’s European-Pacific characteristics. In fact, I think that this autumn marks a milestone with respect to Asian politics: the Eastern Economic Forum was attended for the first time by all the leaders of Northeast Asia except North Korea; I also know that you will attend the East Asia Forum in Kuala Lumpur. There are big problems in Asia, and one of them, my favourite, is the Korean problem. Now we can see significant progress. Last year when we met it seemed that we were on the brink of war, but now we may be on the brink of peace. How do you think Russia can help the peace process, in particular, the agreement between North Korea and the US? It is no secret that the Russian diplomats do a lot, but maybe they can do more. And regarding sanctions. We suffer under the sanctions. Our trilateral project, Rajin-Khasan, suffers. Isn’t it time for us to take some measures in this regard? Vladimir Putin: You know, the situation around the Korean Peninsula is moving in a positive direction in general. You have noted this, too; we all can see this. You have just said that we were on the brink of war, and now, thank god, we are on the brink of peace. Direct contacts between the US administration and North Korea are ongoing. I hope they will continue soon, in the near future. We hear that preparations for a new meeting between President Trump and Kim Jong Un are underway. I also hope it will take place. Let me express my position once again; I have already spoken about this. I do not think that this work will be effective if it is a one-way street. Demanding total disarmament and total denuclearisation from North Korea without providing any security guarantees is hardly a good approach. Nevertheless, anything is possible. If North Korea believes the promises of the US, this could be the best way to de-escalate the situation. It is difficult for me to say. What positive role could Russia play here? We could implement those trilateral plans we have discussed many times: connecting the South Korea – North Korea – Russia railway; power lines; and a pipeline from Russia to South Korea via North Korea, including gas routes. We still could establish some joint enterprises. Of course, it would be a contribution. This is because joint work in the economy unites us and creates conditions to resolve political and security issues. Let us not forget that China has done a great deal in this regard. Russia and the People’s Republic of China have a joint platform. We are trying – I will not repeat this now because I have said it many times – to comply with these joint agreements. What else can Russia do? I think (I have also said this many times, but I will repeat it once again) that it is very important to establish security guarantees for North Korea. Of course, Russia could also play a certain role here, because I believe that if we want these guarantees to be effective they should be international. We do not want to see any military action there or any tensions. Russia and North Korea are neighbours; so Russia, as a permanent member of the UN Security Council and a nuclear power, as well as other participants of this process – China and the United States – could of course make a contribution by creating and participating in the system of guarantees. Director of the Kazakhstan Institute for Strategic Studies under the President of the Republic of Kazakhstan Yerlan Karin: Good evening, Mr President. I would like to take the Asian issue further. Five years ago, during his visit to Kazakhstan, Chinese President Xi Jinping spoke about the Belt and Road Initiative. Two years later, you and the Chinese President adopted a joint statement on integrating the Eurasian Economic Union and the Belt and Road Initiative. Today, given the current events in the international political arena, all these sanctions and more trade disputes between China and the United States, are these initiative still relevant? Are they losing their importance, or are there new prospects? I would like to hear your point of view. And the second question. In August, together with your colleagues, leaders of Caspian states, you adopted a very important document in Aktau, a convention that, as many think, has become a sort of constitution of the Caspian region. How do you see the further cooperation in the region and the resolution of other issues related to this area? Vladimir Putin: First, as regards China’s Belt and Road Initiative and everything related to it, including the economic aspect. This initiative of our friend, and I indeed consider him our friend, Chinese President Xi Jinping, is becoming even more relevant. This is because all economic restrictions are, on the one hand, putting pressure on the global economy and markets, which is a negative factor, yet these actions create certain windows of opportunities. This means that in these circumstances Russia can carve out an additional niche. For instance (this is not the key point, but still): Americans used to deliver a great deal of soybeans to China, and now we will slowly enter this Chinese market with our soy, and we will give our Chinese partners the opportunity to produce soybeans in the Russian Far East in the event they want to invest their money in this agricultural sector. Say, in aircraft engineering. Indeed, China like us was a major purchaser of Boeings. And now together we have intensified the work on a wide-bodied long-range aircraft. We will move on and construct big heavy helicopters. We will jointly continue our work on space programmes. We have a huge trade turnover when it comes to the field of military-technical cooperation and we have agreed that we will engage not only in sales but we will also transfer technology. We are interested in this not to the detriment of our security and nobody should have any doubts about this. This is why I mention the high level of trust between our countries that we have attained. The development of infrastructure is extremely important for the region in general, so we welcome, say as part of this Chinese initiative – the Silk Road – participation of our Chinese friends in the development of the Northern Sea Route. These are absolutely specific things. The Chinese Silk Road Fund is one of the shareholders of our new LNG enterprise in the Arctic established by our company NOVATEK jointly with the French company Total. This is real work. The enterprise has been built and is up and running. Therefore, someone’s sanctions do not make this initiative less relevant, on the contrary it is taking on a new aspect. Our trade turnover with EU countries is actually growing. It shrank by 50% but now it is increasing year after year. Trade with the Asian-Pacific region is expanding at priority rates. While the EU share in our trade turnover is 42 percent, the Asian countries have already reached 31 percent and it is on the rise. Of course, we are interested in building infrastructure, including in the field of transport. Of course, we are interested in building up the operations of the Trans-Siberian and Baikal-Amur railways. We expect the railway cargo traffic to go up four times and the cargo traffic along the Northern Sea Route to grow up to 80 million tonnes. And all this is absolutely naturally compatible with the Chinese initiative and our development within the Eurasian Economic Union where Kazakhstan is also one of the key players. So, we are happy with the way this situation is developing in this sphere and we will be most active in working jointly with all our partners.